You will be given a reference e-book to read which has 340 pages And the test will be based on that e-book , you can take final test within 1 year of purchase. Workforce planning refers to a continual process which is primarily used in aligning the priorities and needs of organizations with the operations of its workforce as a means of ensuring that these meet the regulatory, production, service and legislative requirements and the objectives of the organization. Workforce planning is also a major help in enabling good evidences that are primarily based on strategies for workforce development. It should also be noted that this essential business process works by ensuring that a specific business organization can easily access talents or prospective candidates that are capable of undertaking required business activities such as decision making as a means of guaranteeing business success in the future. Accessing potential talents involve taking into consideration prospective workforce resources including partnerships, contracting out, employment and modifying activities of business as a means of changing different types of required talent. Workforce planning cycle also involves the act of filling out resource requests, resource utilization analysis, capacity forecasting, management and identification of human resources that can be used in filling out the forecasted capacity and starting the whole cycle again. It is also important for you to note that the framework which is now applied in workforce planning and development is strategic workforce planning. This works in linking strategic and corporate objectives together and demonstrating their related workforce implications. Brainmeasures workforce planning certification program is now one of the most impressive online certification courses provided by the leading online certification provider worldwide. This workforce planning course from Brainmeasures is guaranteed to help anyone who wishes to understand everything about this essential business process. With the help of this certification course, you can access Brainmeasures workforce planning training which is comprehensive and detailed enough to cover every essential aspect linked to the process including how it works, the different framework used in implementing it, its major benefits and functions, the different tools and techniques used by experts in this field in order to effectively evaluate and analyze human resources and the best thing that a business organization can do to make the best out of implementing workforce planning. Earning a workforce planning certificate is also very rewarding considering its effectiveness in letting the industry know about how skilful and proficient you are in implementing workforce planning. How to develop and implement the best workforce planning and strategic staffing process? How to successfully implement and support your established strategic workforce planning process? How to engage and involve managers in the whole process? How to effectively analyze and apply the results of your staffing plans? 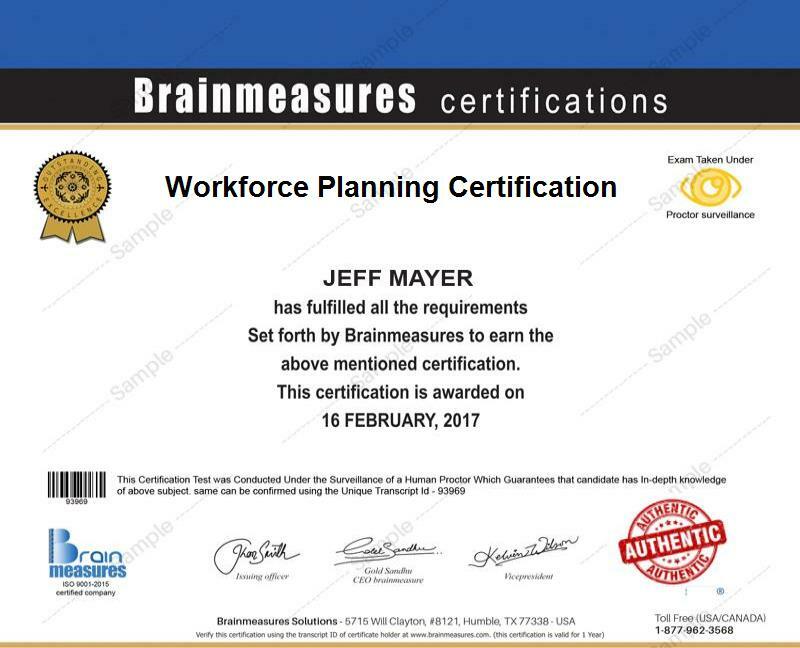 The workforce planning certification program which is now available at Brainmeasures is created in such a way that it provides numerous benefits to a variety of professionals. The program mainly targets individuals and professionals whose daily responsibilities involve workforce planning, recruitment and retention, human resource management, professional training and development, workforce optimization, organizational development and people management. A workforce planning certification is also a huge help in improving your financial stability. You may find your workforce planning certification useful in your attempt to get employed in the position of a certified workforce planner and earn an average salary of $76,000 annually. You can also perform the responsibilities of a workforce planning manager and this profession will reward you with a salary within the range of $64,000 to $154,000 per year.